The industrial world is going through a demographic transformation. 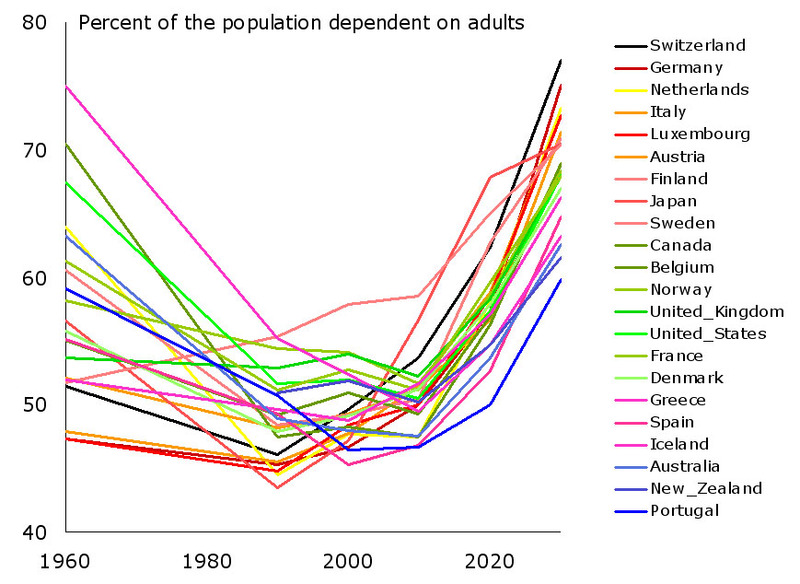 The figure shows dependency rates for all of the OECD countries. These were high in the 1960s, due the Baby Boomers, and will be high after 2020 due to the number of elderly. Old age draws on a great deal more than pensions, of course. It has fundamental consequences for a health service that was generally set up to treat acute illness in a young population, rather than mass chronic geriatric care. The IMF assessed the costs of ageing in terms of pensions, health care and general support, and came up with the figure that is shown below. Broadly, direct pension costs are matched by adult care and roughly doubled again by health care. One should note that health care costs per middle aged person have been increasing much faster than GDP, due to new and costly treatments. US health provision consumes around 16% of GDP, and 62% of personal bankruptcies cite health care as the cause. Most other developed nations spend about a tenth of gross product on state-funded health care. We shall see that all of these numbers are written in shifting sand. The figure was produced in 2005, and the financial crash has altered the assumptions that underpin these data. They do not allow for differential health cost inflation, and they assume longevity numbers that are changing with every assessment. Current assessments are varied but see the 2050 numbers shown as now being typical of 2025. In effect something around 7-10% of GNP will have to be redirected to coping with old age. On the left, private pension assets are shown as a percent of GDP in 2012. This shows an enormous scatter, with a dozen OECD countries reasonably well-financed and the remainder with almost no private provision at all. France has pension-related savings of only 0.2% of its GDP. It is worth noting, however, that although it sits quite high on the chart, private pension funds in the UK have an estimated £217bn shortfall. As many of these have a corporate contributory element, UK companies will need to add 13% of their cash flow to make up the shortfall. The situation elsewhere is often much worse, but also extremely hard to assess. On the right of the figure, we have plotted these same figures against state pension provision as a percent of GDP. There is evidently no relationship whatsoever in this. Countries such as New Zealand, which has nether of these at a high level, and facing a challenge. On average across the OECD, state-provided public pensions account for 60% of income in old age. The other 40% is made up equally by income from work and from private pensions and other savings. Unhappily, state provision and private pensions for state workers are both in deep trouble in many countries. The sums involved are simultaneously immense and diffuse. The British Office for National Statistics says that: "public sector obligations fall into a spectrum ranging from clearly measurable and time-bound liabilities through to remote and unquantifiable contingent obligations." For example, independent assessments from the US pensions industry say that public pensions are $4.6 trillion short of the assets that are needed to cover projected liabilities. Moody's Investors Service suggest $2 trillion. A report commissioned by Federal Reserve Chairman Paul Volcker said that unfunded pension liabilities were $3 trillion. Why is it so difficult to arrive at a clear figure? There are many uncertainties. People are living longer, but we cannot know how much longer insofar as medicine is at the threshold of huge advances. Equally, they may well be able to work for longer, but we do not know by how much. Many have been forced into early retirement, which is a process which may slow or accelerate. Where money has been set aside to meet pension needs - which is far from everywhere - the rate that this will earn in the market is unclear. Most funds were set up on an estimate of around 7% yield, across OECD, pension funds have experienced a net -1.6% return since 2008. Original projections look very optimistic. Most public pensions are indexed to inflation - now, something less than inflation, setting them on a downward course - and inflation prospects are imponderable. Let us begin with Europe. Some countries have funded their commitments from contributions, leaving a smaller state element, but others are wholly exposed to finding the money from current revenue. Pension deficits are normally not included in public debt figures - and so hard to estimate - but an authoritative report in 2009 said that the average EU country needs to dedicate 8.3% of GDP a year to fund current pension policies. Demographics imply that whilst the average EU pensioner was supported by almost four workers in 2010, it will be 2.5 in 2030. 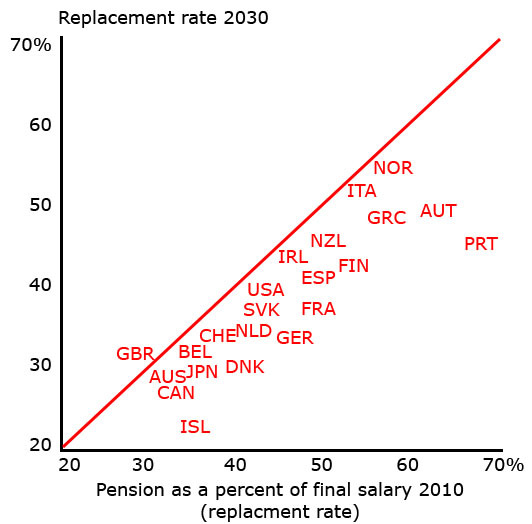 Overall, the European pension shortfall is estimated at between 100% and 200% of GDP. 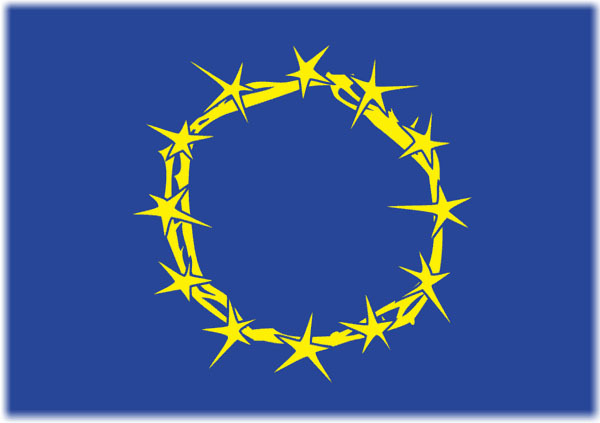 European citizens must save an additional €1.9 trillion annually, or 19% of current GDP. This will not be achieved, and the result is a reduction of the expected net pension. Political issues will follow, not least as the elderly become a substantial voting block. Current plans to reduce pensions entitlements move the so-called net replacement rate (percent of previous after tax earnings) that can be expected. Increasing the rate of return from 5% to 8% still leaves a pensions gap of €1.66 trillion. Increasing the state pension by 10% still leaves a pensions gap of €1.59 trillion. Getting by on only 50% of pre-retirement income leaves a pensions gap of €669 billion. Increasing the national retirement age by 10 years leaves a pensions gap of €841 billion. Non-pension assets may only fund as little as 20% of the pensions gap. The issue of the retirement age needs to be considered. Medical improvements mean that people not only live longer, but are physically capable of working for longer. Some have mentioned a retirement age of 75, but the UK has adopted an official target of 68, attained with remarkable precision in 2046. The problem with this approach is first, that this may crowd out younger workers - increasing other welfare demands - and second, that many of the less educated may in fact be unemployable, simply switching the problem from pensions to unemployment benefits. Individual countries have major problems. The European Central Bank note that nineteen EU countries have state pension obligations that are five times higher than their current combined gross debt. Freiburg University calculations found almost €30 trillion of state pension obligations, with Germany accounting for €7.6 trillion and France €6.7 trillion, which is three times their respective GDPs. Both have major changes to their dependency ratios in prospect. 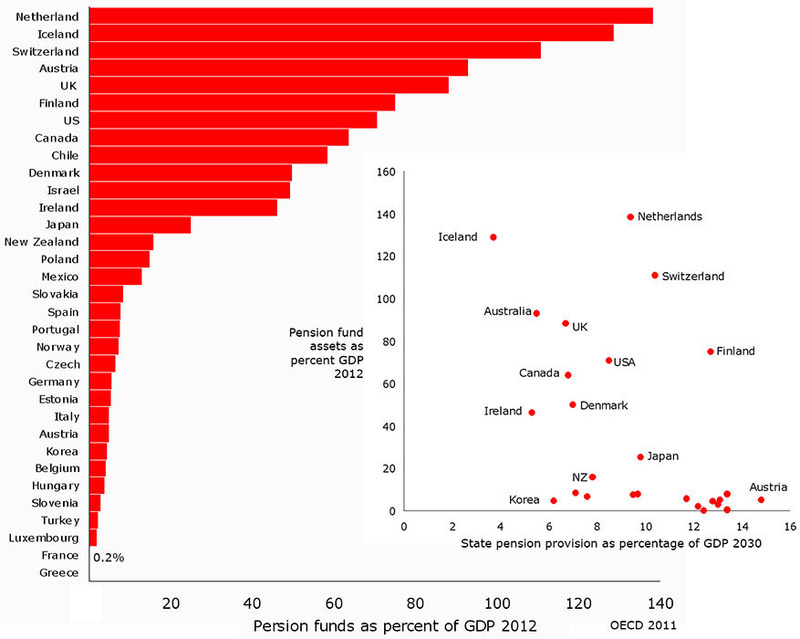 Europe, therefore, has an immense problem around state pension provision. Unhappily, the same is true of the US as well. And Japan, And, in prospect, China. We have already seen something of the scale of the US deficits. The individual states have liabilities that are variously calculated at one to three trillion dollars. The reasons for the vagueness have already been explored. Cities and municipalities also have around 3,200 locally-administered plans, which are in deficit to the tune of about half a trillion. California has an unfunded deficit of a bit over half a trillion, implying an average of $16,386 per person, The equivalent for Texas is $11,117. The total is probably going to bring overall US state indebtedness to around $20 trillion. To put that sum in context, US spending on World War II was around $4 trillion in today's money, according to the Congressional Research Service. The overall operational costs of World War II to all combatants were about $19 trillion, of course with unquantifiable and massive destruction of physical and other assets. Current European pension liabilities - never mind all of its other debt - is about the same as the direct cost of World war II to all of the combatants. Few will need to be reminded of the austerities that followed: by high taxation, expanding deficits, complacency about inflation - which is to say, robbing savers - and the general degradation of the national capital stock. In 1945, however, it was possible greatly to expand the labour force. The industrial nations had a near-monopoly on mass manufacture, on organised finance, on telecommunications and transport and, of course, on the all-important science and technology. The bulk of the world's consumers sat on its doorstep. It had a significant fraction of its potential work force unemployed - particularly women - or else under-employed, and its populations were, by global standards, young. State spending was only around a quarter of GDP in most countries before the start of the conflict, and increased taxation had a long way to go before it met natural limits. None of that is true of 2025, when competition from emerging markets will be extremely intense, and demographics unattractive. Taking the world as a whole, the World Bank believes that an additional 7.7% of world product will go into support for ageing by 2040. However, the present value of the pensions deficit could reach parity with world product, ignoring the health and other costs entirely. Doing nothing is not an option. The IMF notes that "many economies will need to achieve significant fiscal consolidation to lower their debt-to-GDP ratios over the next two decades. A major rationalization of public spending will in many cases be required to support this fiscal consolidation. 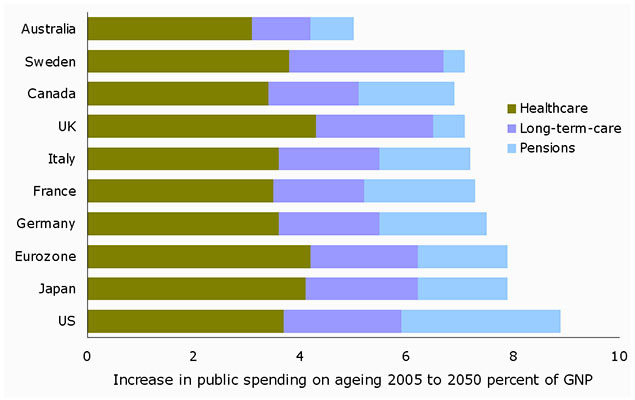 Pension spending now accounts for about one-fifth of primary total spending in both advanced and emerging economies. Over the next 20 years, the average present discounted value (PDV) of pension spending increases is 9 percent of 2010 GDP in the advanced economies and 7 percent in the emerging economies. The cumulative PDV of increases in pension spending over 2010–2050 is 36 percent of 2010 GDP in advanced and 48 percent for emerging economies." "Further reforms are needed that are both fiscally and socially responsible. We cannot risk a resurgence of old-age poverty in the future. This risk is heightened by growing earnings inequality in many countries, which will feed through into greater inequality in retirement." National differences are huge. The OECD notes that half of its member countries have cut back on public pension commitments since 2008. Seven countries cut pension benefits directly, amounting to a 23% cut for all, whilst others were progressive, giving an average cut of 15-20% less. Current average net replacement rate will be around 60%, which is below what is regarded as the sum required to maintain a standard of living. The trend will continue - France's net replacement rate will fall to something over 40% by 2040 if the books are to balance, That is a level that implies widespread geriatric poverty, political activism and pressure against reform. Many countries are now requiring private savings, but this will have to be very large to have a significant effect. To increase revenues through higher contribution rates or taxes. Rising international tax competition and the unpopularity of further taxation greatly limits this tool. Equally, unless hypothecated, such sums will likely be absorbed by the many other demands on state funds. To change the portfolio of expenditure, lessening for example education or defence. To put this in context, the scale of the task would require the equivalent of the elimination of all defence. spending in the United States and all spending on public services and defence in Japan. To raise the retirement age. An increase by 5 years would be sufficient to eliminate the fiscal imbalance in many countries. The labour market will be tight - for the very demographic reasons that we are discussing - but whether there will be an appetite for 70 year old workers is unclear. Plainly, it could be mandated to exist. To tweak the nature and scheduling of benefits, by - for example - offering lower initial benefits, by means testing, by changing inflation indexing or by simply lowering the sum. 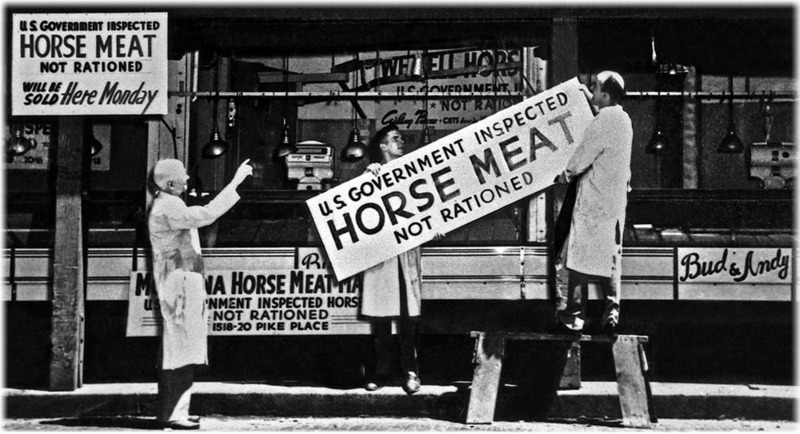 Once again, this shifts the problem from an economic to a sociopolitical one. To hope that medical advances will not merely extend lives, but manage or mend chronic conditions that lead to dependency: mental illness, psychological instability and learning difficulties. These affect around 12% of the working age population at any time. If old age could follow the "light bulb" model through medical care - that is, to burn bright and suddenly fail, rather than gradually to dim itself out - then this would enable an elderly workforce. None of these are very convincing. Some nations are going to see very considerable falls in the standard of support in old age. Other forms of welfare will come under very intense pressure indeed, notably young adult support for the mentally and physically able.